Why a Bible study lesson on overcoming temptation? Many times we are mistaken about where temptation comes from and the best way to deal with it. So many times we think we can overcome temptation in our own strength. Have you ever thought of temptation as an itch? When we have poison ivy, an insect bite, etc., we know in our heads not to scratch because scratching will just make it worse! The "itch" almost begs us to scratch though! This past week I was picking up trash in our yard that was left by a storm, and I must have picked up something that had touched some dreaded poison ivy! 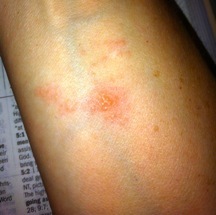 The itch of poison ivy is almost unbearable! However, if I give in to the temptation to scratch it, the poison will spread and it becomes that much worse! As I did my best to refrain from scratching, it made me think of how temptation can seem overwhelming at times in our lives – like an itch. It would be so easy to just give in and scratch, but that wouldn’t make it better. Just like the poison ivy will spread and become that much worse, sin will too if we give in and scratch it! Temptation comes with living in this fallen world. Paul states it plainly in the first part of 1 Corinthians 10:13 -“No temptation has overtaken you but such as is common to man;"
Temptation in and of itself is not sin. Giving in to the itch of temptation leads to sin though. There are those things we allow ourselves to brush up against or even jump right in because our flesh wants to experience it. God, however, does not tempt us. There is a huge difference between being tempted and being tested. Temptation is a pull toward evil, a pull toward sin. God would never tempt us to sin; Jesus came to save us from sin! So what do we do? First of all, don’t touch the poison; stay away from it! Brushing up against it just makes it itch more! Do not give in to the itch! I coated the poison ivy with a medicated spray that helps it not itch and causes it to begin to dry up and heal. God’s Word is healing. When we turn to God, He is always there to help us resist temptation. Jesus time and time again reminded His disciples to pray when facing temptation. Matthew 6:13 "And lead us not into temptation, but deliver us from evil." Jesus Himself was tempted by Satan. The Gospels record how Jesus was led by the Spirit into the wilderness for 40 days to be tempted. "Immediately the Spirit drove Him into the wilderness. He was in the wilderness 40 days, being tempted by Satan. He was with the wild animals, and the angels began to serve Him." Jesus overcame temptation though; He did NOT sin. And by His power and life, overcoming temptation is possible for us as believers in Him! "For we do not have a high priest who is unable to sympathize with our weaknesses, but one who in every respect has been tempted as we are, yet without sin." "For everyone who has been born of God overcomes the world. And this is the victory that has overcome the world—our faith." Galatians 5:16 ﻿"But I say, walk by the Spirit, and you will not gratify the desires of the flesh." ﻿James 4:7 "Submit yourselves therefore to God. Resist the devil, and he will flee from you." Ephesians 6:11 "Put on the whole armor of God, that you may be able to stand against the wiles of the devil." The next time you experience an itch, let it remind you to also be aware and beware of temptation. Don’t give in to the itch…it will just cause the poison of sin to spread! Instead, run to God in prayer and get into His Word! Overcoming temptation is possible through Christ! Another free Bible study lesson for kids on overcoming temptation is illustrated through using a fishing net or trap as an object lesson!